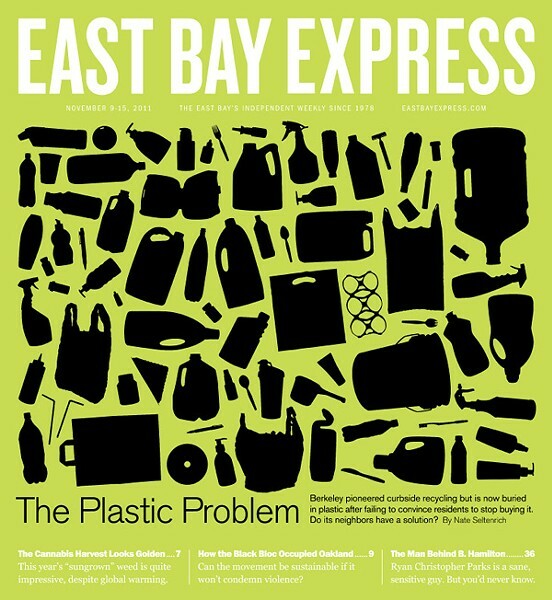 Readers sound off on plastic, the Black Bloc, and Occupy Oakland. Why pick on Berkeley? Why blindly accept the inevitable presence of plastics in the waste stream? I've been a lifelong recycler, but the idea of source reduction is much more efficient (in terms of energy and resource use) than recycling. And that means going to the source — not to the consumer. Instead of trying to teach busy residents the niceties of plastics separation for disposal, it would be better not to make so much junk in the first place. And to change that, we need to control the manufacturers and commercial users, via lobbying and legislation. Just accepting the inevitability of the growth of plastics use, as Seltenrich does, doesn't make sense. Think of other pollution problems: Maybe it was acceptable forty years ago to emit any kind of toxin into the air or water, but now we have laws regulating emissions. Similarly, we need to regulate the unmitigated flow of plastic packaging and products into our society. Plastics don't need to be made from petroleum. We don't need to let a national discount chain (Trader Joe's) put plastic clamshells around every pound of produce, just because it doesn't want to install scales at its checkouts. We can replace plastic CD jewel cases with cleverly designed recyclable cardboard sleeves. Why not go back to putting dairy products in wax-lined, decomposable cardboard? What about reusable, recyclable wood and metal? Most of all, why should it be up to the cities to figure out what to do with this crap? It's the production system that's messed up, not the disposal system. Source reduction is indeed a critical piece of the plastics puzzle, but the results of recent waste audits commissioned by the agency StopWaste.org reveal that Berkeley's efforts are insufficient. Plastic waste in the city increased by 31 percent between 2000 and 2008. Regarding the inevitability of the growth of plastics on a broader scale, look at the nationwide plastics use and disposal figures from the American Chemistry Council and the US EPA: They've been rising steadily for fifty years, and show little sign of relenting. It's essential that we address this issue on both the front end and the back end. As municipal waste handlers, cities must play their part in finding a responsible and holistic solution beyond landfilling nearly all used plastics ad infinitum — especially in Berkeley, which hopes to achieve zero waste by 2020. Berkeley's recycling center accepts plastic and has done so ever since 1986. While the city may lobby against proliferation of plastic, it does recycle plastic when there is a viable market. Plastic bottles #1 and #2 have a strong and stable secondary market, which is why those plastics are recycled by everyone. Other plastics, particularly mixed plastics (#1 through #7) have little or no value and are rarely, if ever, recycled in California. The article notes that Oakland and El Cerrito contract with Waste Management and RockTenn to collect their plastics. However, collection does not equal recycling: To recycle a material means to re-manufacture it into feedstock for new products. Instead, some of the mixed plastic these cities collect is landfilled, and most is compacted and shipped to China for further sorting, at additional financial and environmental cost. Perhaps Berkeley is right that this practice is not a good choice. Green Toys, Inc. of Mill Valley hopes to use post-consumer #5 plastic to manufacture a new toy line, and found Envision, a plastic recycler (re-manufacturer) in southern California, that has the capability of turning 100% post-consumer #5 plastic into clean, re-usable pellets. Envision needs a source for feedstock, but when Green Toys approached Waste Management and other large MRF operators in the Bay Area, they were unwilling to separate out their #5 plastic. It was Berkeley who agreed to separate #5 plastics from their container stream to enable this toy project to be assessed for feasibility. Berkeley's participation in this pilot project represents a meaningful step toward developing plastic-recycling infrastructure in this country. It is this type of pilot project that will help promote demand for recycled plastic which is the real driving force behind eventual development of plastic re-manufacturing capability! At an independent, truth-seeking newspaper, journalists have the responsibility to frame the controversial terms and issues they report on. In the November 9 edition of the Express, both Robert Gammon and Rachel Swan use the terms "vandalism" and "violence" interchangeably while discussing Occupy Oakland. These words are not synonyms, nor should they be used frivolously. Both Gammon and Swan seem to consider broken windows and trash can fires as acts of violence, but windows do not bleed and trash cans do not suffer. Nor can windows and trash cans go hungry, undereducated, or homeless. Corporations are not people. The events that occurred after sundown on November 2 were acts of vandalism, not violence. If Gammon and Swan were looking for acts of violence stemming from the Occupy Oakland movement, they could have emphasized police violence. Police officers, acting under the direction of elected city officials, have used numerous violent tactics — from tear gas (of which I was a victim), to rubber bullets, to batons, to fracturing Scott Olsen's skull with a projectile — in order to suppress constitutionally protected freedoms of assembly and expression. If the Express uses the word "violence" to characterize the tactics of Occupy, they must show equivalent demonstrations of force against human beings, not corporate property. There are instances where the line between vandalism and violence muddies. Fear is an act of violence. When vandals smashed windows at the business where I work, many of my co-workers were terrified. The memory of the fear they felt may harden them against a movement that acts in their name. A nuanced inspection of vandalism and violence should have accompanied Gammon and Swan's articles, but instead they used the terms like synonyms. One of the great triumphs of the global Occupy movement is that it has induced people to question widely held misperceptions. Journalists must perform the same function. I urge the Express and its readers to question the myth of a violent movement. The status quo that bails out banks that force people from their homes is violent. Police and city administrators who have caused verifiable injuries are violent. Occupy Oakland is responding to this violence, not causing it. Before equating a few isolated acts of vandalism with fractured skulls and ruptured spleens, the Express and its readers must reflect on their values. If you believe corporations are people, then violence has been done. If violence is an act that can only be committed against fellow human beings, then the Express should retract the accusation that Occupy Oakland is violent. I'm thankful for your coverage of the disorder the night after the Oakland General Strike. Despite the slant, and the description of anything the authors disagree with as "violence," no other commercial media outlet has successfully composed a coherent narrative that gets the gist and the sequence down of what was actually going on. However, I have three issues. Your narrative fades out when "the scene [on the night of November 2] had evolved into chaos." While the building takeover may have been half-assed, and the bonfires may have been foolish, what shocked people across the spectrum was the random destruction — including that to small businesses. First, it is unclear how involved with the building takeover the opportunists responsible for this were. Second, flyers inviting people to the takeover were circulated throughout downtown that night, so a lot of people in the takeover were not involved with the people who initiated it. Even though Black Bloc fashion and energy were clearly present, it's at best an oversimplification to say an organized group ruined the night. You mention that the police reaction was random and brutal, and preceded the destruction. Besides the arrests you mention, there were several shocking incidents of police violence that were covered widely in the media (usually one per article). For people involved in the takeover fiasco, to say it's all the cops' fault is disingenuous; they should focus on their own mistakes. But progressives or reformers who have ideals for how police should function in society should be very concerned. And anyone who sees the police as part of our social solutions might question why thrill-seeking opportunists who could smash windows anytime, anywhere feel safest doing so amid a display of overwhelming police power. Third thing: Your main point seems to be that Occupy embraces "violence." That the General Assembly rejects "non-violence" resolutions imposed from without does not mean people endorse the fiasco on November 2. That's like saying that people who oppose the authoritarian gang injunctions approve of street violence. Some critics even oppose takeovers of foreclosed properties as "violence," even though that might be the most important thing Americans can do about the One Percent crisis. Most Occupiers are interested in thoughtful rather than simplistic solutions that allow Occupy Oakland to be a better neighbor yet keep its innovation and its edge.